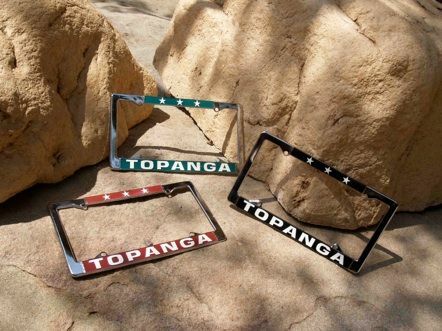 THE TOPANGA LICENSE PLATE FRAMES made its debut several decades ago as a fun way to promote our town and help fund Topanga Town Council programs and projects. Since that time, hundreds of frames have been sold and can be seen displayed on local cars. Today, the Town Council is also offering a new frame design to show off resident civic pride or for you to give as a gift. We thank you for helping support important programs that serve the Topanga community! To see how your donation helps Topanga's special causes, click here. In-Store Only: Topanga Lumber, 506 S. Topanga Canyon Blvd.